The Grosvenor School of Art was set up in Warwick Square, London in 1925. Over the next four years Claude Flight held informal lectures on the art of linocutting, educating some of the best known artists of the movement including Cyril Power, Sybil Andrews, the Australian artist Ethel Spowers and the Swiss artist Lil Tschudi. 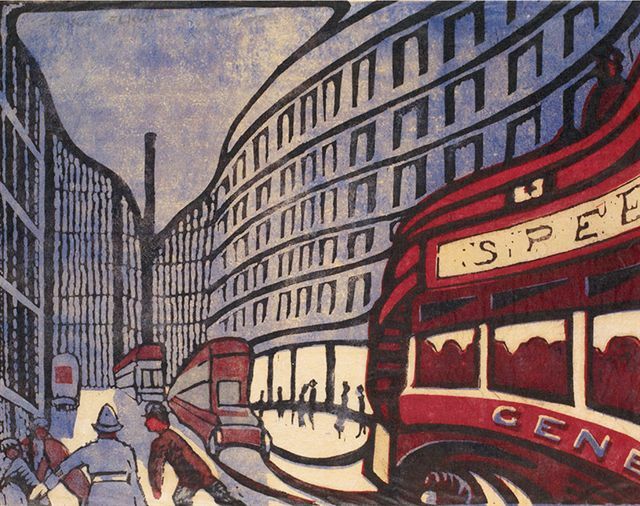 Claude Flight’s innovation in linocutting created a bold new image in the world of printmaking. Encouraging his students to use different blocks for different colours, he also promoted using fine oriental paper which allowed the ink to dry on the surface giving the prints their distictive layered feel. The clean blocks of colour and sense of movement created a strong design-led image which was reminiscent of Art Deco and Futurism and tended to focus on and around the theme of sport and transport. Within the last ten years the Grosvenor School Prints have become hugely collectable. Originally intended to be affordable and fetching only a few guineas at the 1929 Redfern Exhibition, the prints now fetch record amounts. The first ever auction devoted to the Grosvenor School prints was held in Britain last year at the London Original Print Fair at the Royal Academy. The resurgence of interest surrounding the Grosvenor School has resulted in a recent exhibition of prints, ‘The Cutting Edge of Modernity‘ held at Osborne Samuel in London. Cyril Power Linocuts: A Complete Catalogue by Philip Vann has also just been re-released in hardback and is available at the special price of £25.00.